The Phenom brings never before seen features into an unbelievably affordable package. Truly random oscillation gives your practice time the edgea revolutionary, truly random oscillation mixes up the speed, spin, depth, and court location in a manner that never, ever repeats itself. Add in triple oscillation, three pre-programmed drills, random feed, random 3 line function, and an optional 20-function remote control and you have a machine that can go toe to toe with most any player out there. The Phenom is among the latest tennis ball machines. The Phenom is designed for tennis clubs, resorts, and home court owners looking for the latest in tennis ball machine technology at a price well below the competition. The Phenom offers unrivaled full random oscillation. This revolutionary design allows the machine to throw balls throughout the entire spectrum of the court mixing up speed, spin, trajectory, oscillation, and feed rate. This fully random technological advancement allows for the Phenom to realistically simulate true match play, a feature that is unsurpassed by any machine in its class. Tennis Is An Investment In Both Time And Money. When You Buy Lobster Ball Machine, You Purchase Peace Of Mind. That's The "Built For Life" Promise. The Phenom is also equipped with three pre-programmed six shot drills that simulate the most popular styles of play - grinder, all courter, and power baseliner. These incredible drills mix up speed, spin, feed rate, and trajectory preparing you to dominate your competitors. The Grinder tries to wear down his opponents physically and mentally, waiting for the other player to make a crucial mistake. 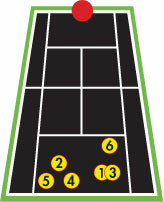 This player hits high, loopy, moderate spin shots that will challenge all players. A six ball drill that utilizes the back court with different types of spin. The Power Baseliner is a player who is explosive in their shot selection, playing with pace and aggression and minimal spin. 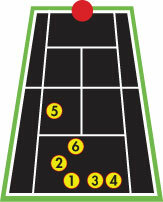 This player exhibits an attacking style, known as "first strike" tennis. A six ball drill that utilizes full back court with little spin and more ball speed. The All-Courter is a player type that focuses their game on tactical savvy. 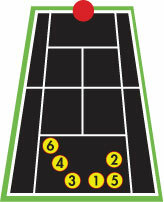 He/she can compete well from the baseline and will come to the net to finish points. When playing this type of player, expect a great deal of shot variety. A six ball drill that utilizes both full back court and front court with some top spin and less ball speed.